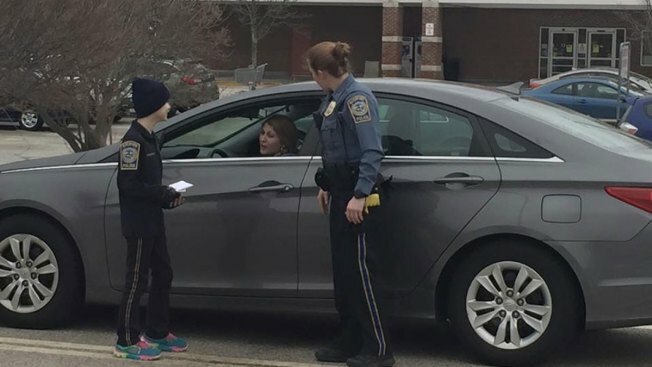 A 9-year-old girl battling cancer helped the Waterford Police Department patrol the streets. Madeline Guarraria, of East Lyme, became an honorary officer with the department last year. Guarraria came in for the evening shift on Tuesday night. She started with roll call where she took notes with other officers before heading out with Sergeant Seymour in her patrol car. The pair patrolled the mall area and Guarraria stoped a person who was littering, according to Waterford Police. After putting a stop to littering in town, Guarraria made the tough decision of pulling over one of her teachers who "ran a red light." As her duty, Guarraria had to give her a ticket. Later, Guarraria observed real traffic stops and even one arrest, police said on their Facebook. Officers allowed Guarraria to speak with dispatchers from the car radio. "We appreciated having the backup today Madeline, thanks so much for your hard work, we look forward to seeing you on another shift!" Waterford Police wrote on their Facebook page.